Snack Girl is always on the hunt for drinks that will replace soda, sweet tea, and lemonade without anyone noticing they are gone. I like water that have bubbles and flavor added to them without any artificial sweeteners. Recently, two different brands sent over some drinks for me to sample and I enjoyed tasting them. My first pick is Herbal Water which is very addictive. Herbal Water infuses exotic organic culinary herbs into pure water, creating a sophisticated drink which is a great replacement for soda. I love the bottle, taste, and elegance of these waters. Flavors include: Lemongrass Mint Vanilla, Cinnamon Orange-Peel, Ginger Lemon-Peel and Lavender Mint, Cloves Cardamom Cinnamon and Verbena Geranium. They have both still and sparkling varieties. You can find them in stores here: Herbal Water Store Finder. They retail for about $1.50-$1.80 each. 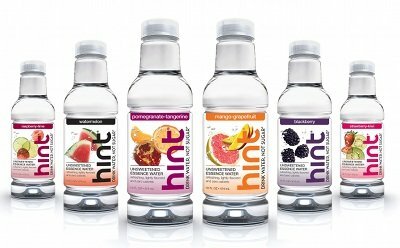 My second favorite water is HINT- which many people have asked me about. These are also made with "essence" of fruits and they have a sweeter flavor than Herbal Water. My problem with these is that they tasted a wee bit like soap to me (which is not a great endorsement). BUT, you have different taste buds and may like this water more than I do - and for a soda replacement - you can't beat it. They have both still and sparkling varieties and include flavors such as raspberry-lime, strawberry-kiwi, and cucumber. You can find them in stores here: Hint Store Locator. They retail for about $2 each. Finally, in a totally different category is the "DIY Flavored Water". You can do this just by using a regular pitcher and adding lemons, cucumbers, orange slices, etc. to your water. 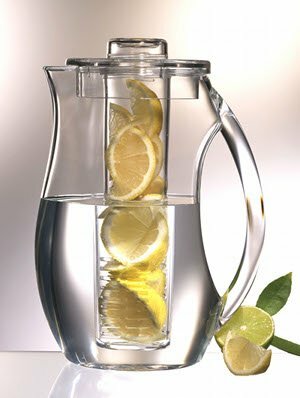 If you are feeling fancy (and have an extra $20 laying around), you can buy an "infusion pitcher". I tried this and it is a great way to keep cold flavored water ready to go. All you do is pack the center with your fruit and then fill up the pitcher. After about seven days, take out the fruit, wash the pitcher, and start again. I wrote the date on mine so I could keep track of when I added my orange slices. Also, I noticed that they called this a "beverage" infuser - so I will just let your imagination take over. You keep filling the pitcher with water whenever you drink it all so you have a constant supply of cold, flavored water. Awesome! How do you deal with sugary drinks in the summer? Thanks for the ideas, Lisa. and it's been really handy for her. She slices up that stuff, puts one serving of it into each spot in a silicone mini-muffin pan, fills each spot with a little water, and freezes it. When she wants one, she pops it out, puts it into the travel press, fills the travel press with water, and then the mint doesn't get in her teeth. Personally, I toss an herbal tea bag into a glass bottle (found these http://www.target.com/p/Glass-Water-Bottle-Gray/-/A-13977658 for $10 at Target - I use glass because I like to see the results of the "steeping"), fill it with water, stick it in the fridge for a day or three, and when I'm ready to drink, I give it a shake, pour the tea into a glass (I usually dilute that 50/50 with plain water), and, depending on the state of my sweet tooth, add a spoonful of honey. I'd love to have that infusion pitcher! Not only is it more eco-friendly, but I'd have flavored water guaranteed free of sweetners, additives, and preservatives. Lime water sounds great! The pitcher looks wonderful! I just found a bunch of recipes about spice and fruit infused iced teas for summer. That pitcher would make those teas effortless and delicious! Thanks, SG! All of the above are great ideas. I will try them one by one. Have a wonderful weekend. I just shared the post on facebook and twitter. 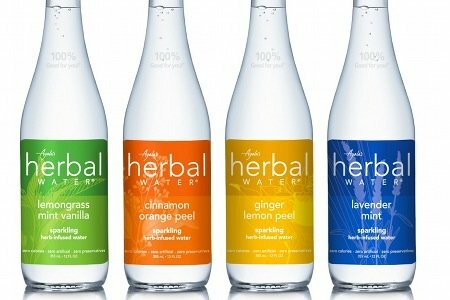 Hmmm, I never heard of herbal water! Great idea! I don't drink to many sugary drinks. I like plain ice tea and simple water with lemon and mint! I have never heard of these waters, so thank you for the store locators. And I'm buying one of those pitchers today! Thank you. Thank you @Leah, I was about to post the same thing. I used to struggle with their/there/they're so whenever I see it used wrong, it bothers me. Yes, I'm trying to get over it. I like that infusion pitcher - great idea! If I had an extra $20 and nothing else to spend it on, I would get it. I gave up drinking sodas regularly over a decade ago, but that only leaves me with water and iced tea. I usually use the Crystal Light iced tea mixes, but now I'm trying to get away from them, difficult as it may be. I kind of forgot about flavored waters. I may try to keep a few on hand for when tap water is too boring and I want some flavor that doesn't come in a powder form. Love the pitcher as well! These drinks look interesting...do you know the sodium count on any of them? I just drink water with RealLemon Lemon Juice and artificial sweetener. If these have zero sodium I just might have to check them out. I try to avoid sodas as much as possible over the summer and stick to water and milk (breakfast). I stopped drinking coffee (with Splenda) and switched over to teas, without any sweetners. The Spiced Chai tastes great even without adding anything. Sometimes I add a little honey to my lemon green tea. Thank you for telling me about the new herbal water I am always looking for ways to enhance water since I don't like plain water. I have tried hint and I like it a little but at times it doies taste like soap. It is hard to find in my area so I don't drink it much. I know you are not a fan of artificial sweetners but lately I have been drinking lots of mio water enhancer inside mineral water. it gives it flavor and isn't too sweet. I als like Lipton diet green tea and of course lemonade regular and diffrent flavored lemonades. I'm a big fan of putting citrus slices in my water. I've never kept them for more then a day though, so it's good to know it actaully lasts a while! I don't have a special jug, just put them in a normal jug floating on top of the water. I love Herbal Water, it is super refreshing but is pretty expensive, so I just buy it for a treat once in a while. I am wondering if you could add similar fresh herbs and spices to the infusion pitcher to create the same effect? Another good choice is LaCroix Sparking Water. It comes in a 12-ounce can, flavors such as grapefruit, berry, orange. Much, much cheaper than the others and you can get it at local grocery stores in a 12-count box. Only ingredients are carbonated water and natural flavor. Tastes great! I just toss a fruit flavored Celestial Seasonings tea bag into a large glass of cold water (or put a couple in a glass pitcher), and within minutes, it's steeped enough to add some ice and optional fruit slices or fresh herbs of choice...cheap, simple, sugar free and delicious! I love the Lavender mint Ayalas Herbal Water, Its a bit pricey though so I only get it as a rare treat. I have tried doing the infusion thing with the water but I did it with lime slices and the oils from the skin made the water so bitter I couldn't drink it. Perhaps I should try again with a different fruit. Looked at Hint and Herbal Water at the store, and at $1.60 for a small bottle they are WAY out of my budget. I did however find seltzer water that was just carbonated water and natural flavor, a liter of it for $0.89. Think I'll stick with that for purchased flavored water! Glad to know there are some healthy waters out there if I am ever in a pinch. Homemade waters rule! Good products! I have another one for you. I help do marketing for Zing Anything, this company that has citrus and fruit Zingers, that allow you to keep the real fruit/veggies into your water bottle The website is www.zinganything.com if you want to check it out. I have one of these infusers and love it; lemon and cucumber is a favorite, but I also like berries and mint. Thanks for the ideas! I have to try the infusion pitcher. In the summer, I like to include citrus and cucumber in water like you mentioned. I've also tried Zevia when I'm in the mood for soda without the added calories and sugar. Hi, My name is Carter and I am a 14 year old entrepreneur who is a 100% supporter of fruit infused water. After watching “super size me”, I began to research about the negative health effects of soda and juice. Diabetes and obesity sound like terrible diseases. My mother, however, was not following this trend. She would create pitchers of water infused with fruit and drink that through out her day instead. However, when she would run out of the house, she would grab a diet coke or plastic water bottle. I asked my mom "why don't you make spa water to go and she said she could not” I was shocked to know that there was not a sustainable, functional and cool looking fruit infused water bottle. I saw the need to make a sustainable, portable version of these pitchers for people on the go. Unfortunately, the only other option for health conscious people is for them to buy plain water or plastic bottles of artificially flavored and sweetened water beverages. Six months ago I started to create the Define Bottle. The Define Bottle is a cutting edge, glass and bamboo reusable water bottle for making great tasting fruit infused water. I took the idea behind fruit infused water pitchers and made it mobile, not to mention stylish. My family were my biggest supporters and I couldnt have done it without them! Fruit Infused water is great for kids too. I have 3 younger siblings and they are nuts over it!